Outlook is unstable when your files get big. I've wasted days of time and lost lots of data trying to manage the files and archives. OST PST Viewer and PSTSplitter solved all of my problems. I was very frustrated with accessing pst files with Outlook. The Outlook instructions are confusing and can cause all kinds of problems with Outlook if not done right. Hours and hours of wasted time. 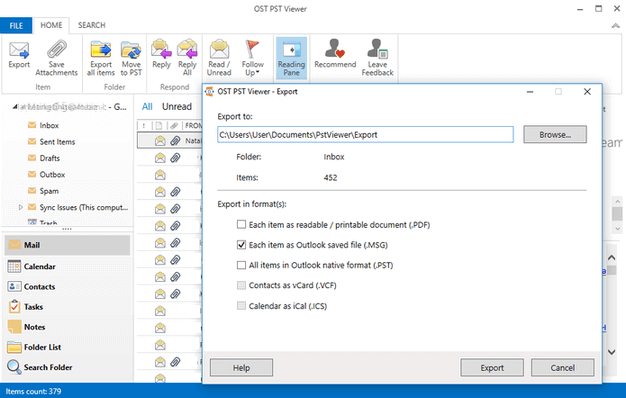 What a relief to be able to view PST files with OST PST Viewer without using Outlook. My company just moved to the Microsoft Exchange, and we had to find the solution to convert the pst files to ost. I have found this program via the internet and it works perfectly, we are considering to buy an enterprise version soon. Thank you 4team corporation! My recommendations. I had real problems with my Outlook. The great software and the support team helped me a tremendous lot achieve my taking back control of all of my mails! OST PST is great, powerful, quick and right-tot-the-point. Just this app could help me to open large files in OST format, where the Outlook was unstable to read this ones. Really works and is very easy to use. great app and simple to use, very cost effective for the project I was working on. Wasn't long to learn how to navigate. The Pst converter and repair worked quickly. I would like to be able to type in the destination folder and filename instead of going through an explorer search procedure.